Matt Fraction’s Hawkeye has become one of Marvel’s best titles by taking a down-to-earth look at the superhero lifestyle, and The Superior Foes Of Spider-Man #1 (Marvel) applies a similar perspective to the wall-crawlers rogues gallery for a fantastic debut. Nick Spencer’s work for Marvel has failed to live up to the quality of his creator-owned projects, but Superior Foes is the first time the writer lets his unique voice shine through in one of his superhero comics. With Boomerang as narrator, this first issue delves into the personal lives of these supervillains with an appropriate level of grit but also a refreshing sense of humor. 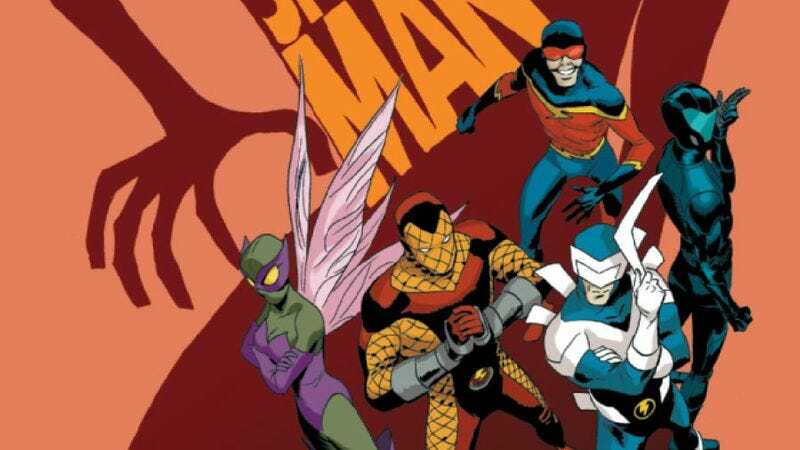 After a quick introduction to Boomerang and his partners in the Sinister Six, the issue shifts focus to Speed Demon and Shocker, who are asked to feed the imprisoned Boomerang’s pet bird and end up robbing a pet store, with Shocker snatching a puppy away from a little girl who wants to give it the stupid name of Inspector. It’s a hilarious plot that highlights Spencer’s skill with quippy dialogue and allows artist Steve Lieber (who penciled half of Hawkeye’s Hurricane Sandy-centric #7) the opportunity to show off his keen sense of comedic staging. The 11th page is a great gag that builds like a Sunday comic strip, complete with cartoonish details like Speed Demon running off and leaving a cloud with the sound effect “pew” in his wake. Valiant has done extraordinary work pairing writers with classic characters that match their individual voices, and Quantum And Woody #1 (Valiant) is the publisher’s best match yet. James Asmus’ The End Times Of Bram And Ben showed a talent for writing genre-bending buddy comedy, and he replaces biblical fantasy with superhero adventure for his revival of Christopher Priest and Mark Bright’s beloved mismatched duo. Unlike the previous incarnation, Eric and Woody aren’t just childhood friends, but foster brothers. Asmus uses flashbacks to give the reader a strong sense of the relationship between the two leads, showing both the positive and negative aspects of their childhood and how that has informed their adult selves. It’s a similar relationship to that of Bram and Ben, but taken to an extreme. Woody is an immoral thief who would rather pee in the sink than the toilet, while Eric is a straitlaced military man looking for any opportunity to do good. Age Of Ultron ended with some considerable character rehabilitation for Hank Pym, so why does he seem so crazy in the pages of Avengers A.I.? In order to defeat Ultron, Hank unleashed a sentient, self-replicating A.I. that looks to be just as dangerous as the villain it helped defeat, but Hank is mostly just impressed that he’s created a new race of robots. The latest title in Marvel’s crowded Avengers line, Avengers A.I. #1 (Marvel) brings together various androids from around the Marvel universe, including The Vision, Victor Mancha of Runaways, and a recycled Doombot, who work under Hank’s leadership to contain the new techno-menace only known as Demetrios. Writer Sam Humphries doesn’t completely sell the concept in this first issue, and it’s unclear what exactly the nature of A.I. has become in the post-Age Of Ultron world.